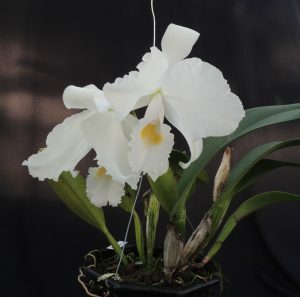 We have a lovely diversity of Cattleya trianae plants and the first to flower this year is our mostly white clone. Cattleya trianae is the national flower of Colombia and is endemic to that country where it is found in open woodland at around 1000m altitude. In cultivation we find that plants enjoy good light and free draining compost but plenty of water when in growth. We grow all our Cattleya trianae plants in baskets hung high in the roof of the greenhouse and filled with a course bark and no moss. The plants produce masses of roots and we keep them just damp in the winter but much wetter in the summer. In our greenhouse Cattleya trianae plants begin to flower in early February and continues into the middle of March. This plant is labelled ‘alba’ and is mostly missing the usual purple and pink colouring but there is a slight pink tone on the lip near the yellow blotch and so we will rename it ‘albescens’ the latin for ‘whitish’. The clone has a lovely growth habit with compact plants and large flowers. We have a second clone labelled coerulea (blue) that isn’t blue to go with this alba that isn’t quite white! There is clearly some wishful thinking amongst some growers.